Is it worth buying smartphones at Flipkart’s Big Billion Days or Amazon’s Great Sale? During the Dussehra season, we witness a lot of offers, deals, and discounts raining on the top of our heads. The same is in the case of the eCommerce platforms in India. Both the major players in the Indian e-commerce space – Flipkart and Amazon put front their festive sale offers. Flipkart’s Big Billion Days, which started from the 20th of September and goes on till the 25th of September. 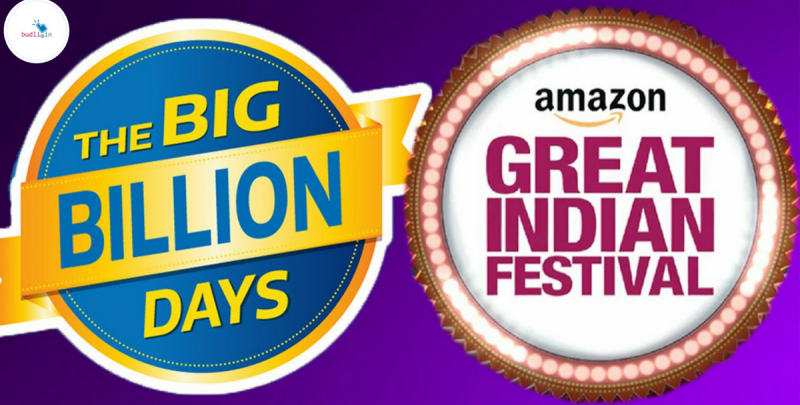 Amazon’s Great Indian Sale starts from the 21st September till the 25th of September. When you open Flipkart or Amazon on the usual days you will find that the products are generally offered a discount of about 10% to 50%. On the occasion of these festive sales, these companies add an additional discount of 10%-30% on the products which in turn adds up to the already existing discount of 10-50% and makes up to that – 30%-80% discount. What’s your takeaway from this? Well, all you need to understand is that during the days of these sales you would find an actual discount price of Rs 300 – Rs 800 on mid-range products and this goes up to discounts from Rs 2,000 to Rs 10,000 too(Super rare cases). Now, coming to the question of buying smartphones from Flipkart and Amazon during these festive sales. Yes, it is worth it. You won’t get such a huge difference but in the end, you are going to save yourself some good amount of money. So yes! Go for it. But don’t worry if you miss out on any of these festive deals as you just have missed out on saving a few hundred rupees. Are you one of those who is looking for a cheaper alternative for the premium phones that you always dreamt of owning. Well, I have a solution for you. The solution that I am going to tell you about gives you a fully functional flagship smartphone for a price that you might not even dream of. Refurbished smartphones – are the solution for your desire of owning a flagship smartphone. These are the smartphones that are open boxed but are tested for functionality and quality before they are sold again to the customers. You might say that this sounds similar to secondhand phones, but no – it is not. You do not have the guarantee of the functionality when it comes to secondhand phones, but that is not the case with the refurbished smartphones. Also, the refurbished smartphones come with a warranty. That means you have an added advantage over others. Now you might be wondering where you can get your hands on such refurbished products? Well, luckily you are already in the right place. We budli.in are the leading marketplace for refurbished products in India. Head over to budli.in and grab the next best smartphone right now!